The Chi machine is a therapeutic exerciser that oxygenates, tones, relaxes and strengthens the body while stimulating the lymphatic system and balancing the body. The Chi machine is used prior to the infrared sauna to enhance the detox benefits. Chi (or Qi) is a Chinese word that refers to the life force or energy that flows through the body of all living things. This is the same energy that is supported, moved and worked with during an acupuncture treatment. We use the Sun Ancon Chi Machine™. It was developed by Dr. Shizuo Inoue, Chairman of Japan’s Oxygen Health Association. Dr. Inoue got his idea by watching goldfish swimming. He postulated that the steady undulation of the spine would exercise and oygenate the whole body, which could tonify and boost multiple systems in the body for overall health. Dr. Inoue spent 38 years researching the effects of oxygen levels on the body and how it impacts the quality of human health, the Chi Machine is the end result of that medical research. “The pattern of motion the machine generates in the human body uses minimum effort and achieves maximum results," says Dr. Inoue. The Chi machine can be a great option for people that are not able to exercise for a variety of reasons, and in terms of oxygenating the cells, just a 5-minute session is equivalent to walking for 30 minutes. 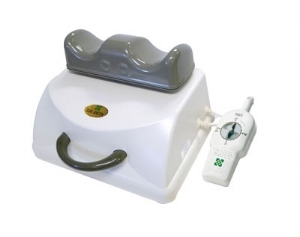 The Sun Anchon Chi Machine is the original Chi machine and is the only machine available on the market that is classified as a Type 1 medical device by the FDA.